Slate of honorees for annual awards gala, Ovation released. Event is inspired by hit movie Crazy Rich Asians and is presented by Pearlstone Partners & Newgard. AUSTIN, TX, US, April 11, 2019 /EINPresswire.com/ — The Greater Austin Asian Chamber of Commerce (GAACC) is proud to announce that its 2019 Lifetime Achievement Award honoree is Simon Tam, of The Slants. This is the highest award that we give out annually and will be presented at Ovation on May 10, 2019. Each year, GAACC recognizes Asian business leaders, companies and organizations that have made significant contributions to the local economy or welfare of the Asian Pacific American community. include Dr. Lisa Su AMD CEO, Sada Cumber, special envoy to the OIC and entrepreneur, The Honorable Norman Mineta, former Transportation Secretary, William Wang, Founder and CEO of VIZIO Inc, Manoj Saxena, Founding Partner of The Entrepreneurs’ Fund and The Honorable Christopher Lu, former Deputy Secretary of the Department of Labor. This year’s gala is inspired by the hit movie from 2018, so it is Crazy Rich Ovation presented by Pearlstone Partners and Newgard. 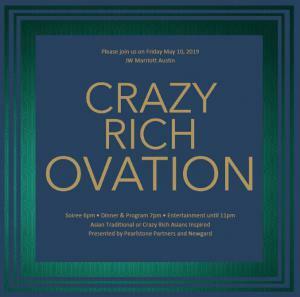 The event will take place at the JW Marriott Austin and includes a cocktail reception, awards program, and entertainment. Ovation is held in May to celebrate Asian Pacific American (APA) Heritage month. The APA community makes up over eight percent of the population of the City of Austin and is the fastest growing demographic, growing twice as fast as the population on the whole. GAACC is in the midst of a growth campaign, Together To 2020: Join the Community, Find your Voice, Accelerate your Success and this event is its most prominent event.